Polish Talmudist; born 1626; died 1666 at Cracow; son-in-law of Abraham Chemiesch. He was for many years preacher ("darshan") in the different synagogues of Cracow. 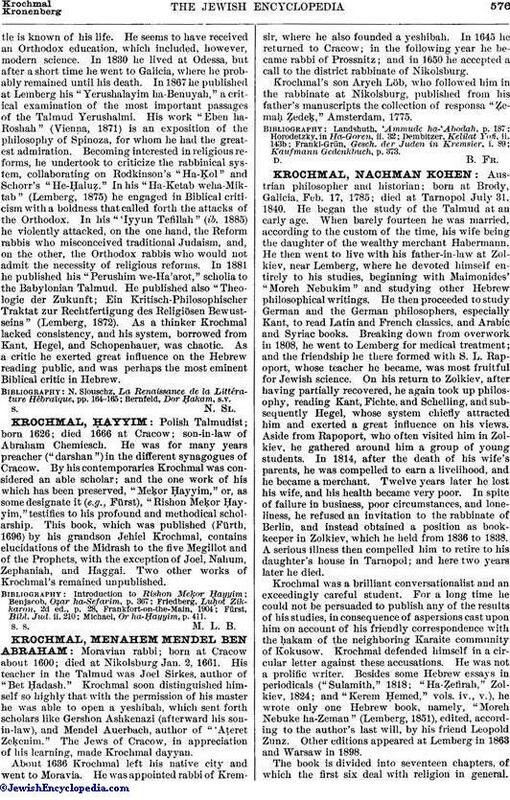 By his contemporaries Krochmal was considered an able scholar; and the one work of his which has been preserved, "Meḳor Ḥayyim," or, as some designate it (e.g., Fürst), "Rishon Meḳor Ḥayyim," "testifies to his profound and methodical scholarship. This book, which was published (Fürth, 1696) by his grandson Jehiel Krochmal, contains elucidations of the Midrash to the five Megillot and of the Prophets, with the exception of Joel, Nahum, Zephaniah, and Haggai. Two other works of Krochmal's remained unpublished. Michael, Or ha-Ḥayyim, p. 411.